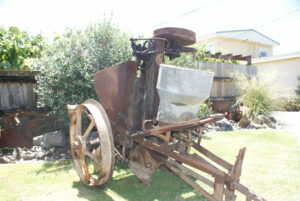 This IH potato planter came from an auction in Blenheim and is in very good condition. The only work to date has been to oil & grease plus make a new hopper where the bottom had rusted out. Made in Australia @ International Harvester Geelong works. The decal is still in OK shape to make a copy. Currently used as a active display at our annual rally. Instead of potatoes I use golf balls to demonstrate how it works. This facinates the kids and they are only too willing to pick them all again to make it go another round.